In the height of the "swinging sixties" the RAF formed an aerobatic team that would win the hearts of a nation. Phil, an after dinner speaker, takes us through the events that led to the creation of the world's best-loved team of pilots. 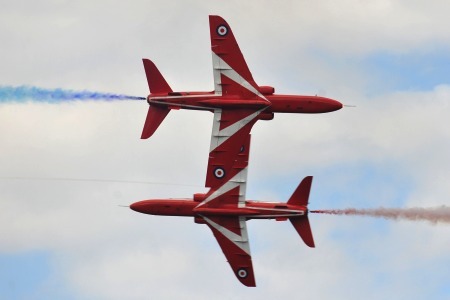 He then introduces the men and women in the famous red suits, who make precision their profession, teamwork their science and aerobatics their art form. Just as exiting for the Ladies as the Men, especially as there has been a female Red Arrows Pilot – so standby for take off with this fun and media rich professional Red Arrows talk. Since the Team’s creation in 1965, the Red Arrows have flown over 4,000 displays in 52 countries. Today the Red Arrows are renowned throughout the world, acting as ambassadors for Great Britain when displaying overseas. They also support UK industry by demonstrating the capabilities of British equipment and expertise.